November | 2015 | In Domino Spera! 1 Kg 17:10-16Ps 146 R/. Praise the Lord, O my Soul! A key theme that’s surfaced in our Bible study (A Quick Journey Through the Bible) is trust. From the very beginning of Creation, God invites us to trust Him. In the Garden of Eden, the rule about not eating from the tree was one of trust: Do you trust that I know what is best for you? Do you trust that’s I’m protecting you? Sadly, Adam and Eve answered no. Abraham was asked by God to leave his home and travel to another land, not knowing where he was going. God was asking, Do you trust me? Abraham said yes. 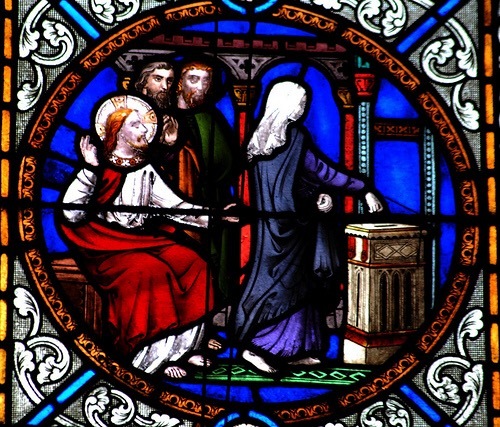 Then God tested him again: Do you trust that Sarah will bear you a child in her old age? Abraham said no. God tested him again; Do you trust me enough to sacrifice your only begotten son, Isaac? Abraham said yes. I could go on and on: every story in the Bible — whole of salvation history — is about trust. God continually reaches out to us asking, Do you trust me? Do you trust that I know what’s good for you? Do you trust that I’ll care for you? Do you trust that I’m going to save you? It’s this same theme that comes up in our readings today. In the first reading, through the Prophet Elijah, God asks the widow of Zarephath, Do you trust that I will provide for you and your son? She shows her trust in God by risking her own life and the life of her son to provide food for the Prophet first. Her generosity proves her trust, and God doesn’t disappoint. The widow from the Gospel takes this even further. She shows her trust in God by being even more generous: she doesn’t wait for God to ask her, she freely gives Him everything, with trust that He will indeed care for her. There’s no indication that she was obliged to give her penny as an offering, but she chose to do so. She chose to deprive herself of her goods so that she might depend entirely on God. This is the testament that Jesus Himself gives her: out of her poverty has put in everything she had, all she had to live on (Mk 12:44). It’s for this reason that Jesus considered her to have put in more than all others (Mk 12:43). My brothers and sisters, our life with God — our life in God — is about a relationship of trust. Do we trust God? Do we trust that He desires only the good for us? Do we trust that He takes care of us and provides for us? If we listen carefully, we’ll recognise in our hearts that God constantly asks us these very questions, that He consistently invites us to trust in Him, more and more. Are we willing to walk into the unknown with Him, or do we want to be in control? Do we place out trust in Him, or in ourselves? God wants us to be completely dependent on Him. That’s why Jesus told us to be like children (cf. Mk 10:15; Mt 18:3; Lk 18:17). God is a loving Father who wants to care for us, who wants to provide everything we need… Do we trust Him enough to allow Him to do that? Do we trust Him enough to be vulnerable and be without our own security? This is a scary thought for us! It certainly scares me. It’s exactly the opposite of what the world and ‘common sense’ tells us to do. Plan ahead, everyone says; make sure you have enough for retirement, we’re told; if you don’t look out for yourself, you’ll be poor and alone… Or worse, you’ll be dependent on someone else! In the biblical sense, a widow wasn’t just a woman who’d lost her husband; a widow was a woman who had no one to depend on, no one to protect her, no one to provide for her — she was all alone, without any security or assistance, without any guarantee of survival, except God. In our readings today, God invites us to be ‘widows’, entrusting ourselves completely to His providence and love. Do we have the courage and faith to imitate these holy widows and give away what we need so as to trust completely in God? Do we trust God enough to ‘give until it hurts’, as Mother Teresa used to say? May God teach us that we can indeed trust in Him, and always depend on His Providence. Amen.